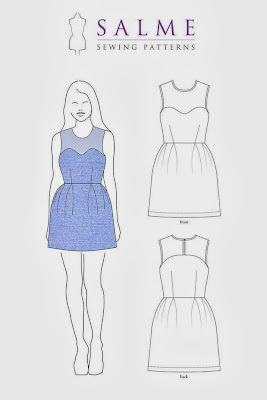 Using the pattern that we have selected for you, create a unique garment that reflects your personality. You can alter the pattern or add to the patterns to make it more you. Think of one or two words that describe you to inspire your look. You will be judged on creativity, craftsmanship, fit, how well represented your description words are in your design, and difficulty. I wanted this dress to reflect my love for vintage and my fun/playful side. I don't always sew vintage because it doesn't always fit my lifestyle. Most of my clothing is office professional looks (suits and blouses) and home lazy looks (sweat pants and tees). I love retro prints and when I seen this cotton print I was instantly in love. 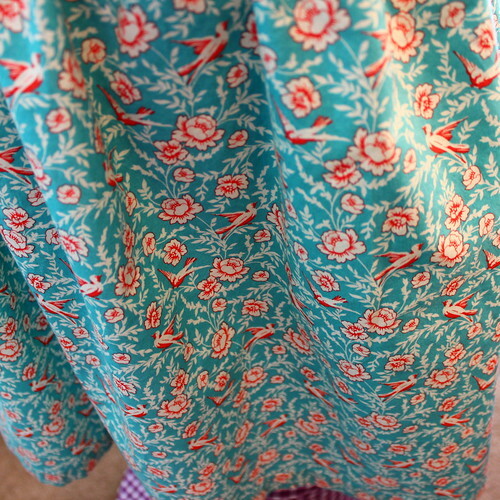 Joann Fabric was no longer carrying it in my area so one of my favorite bloggers, the lovely Rochelle of Lucky Lucille offered to pick up a couple yards for me from her Joann's. So sweet of her. Thanks again Rochelle, xo! To keep with the vintage look I was going for I opted for a gathered skirt rather than the pleats. Short skirts are really not my style anyhoo. 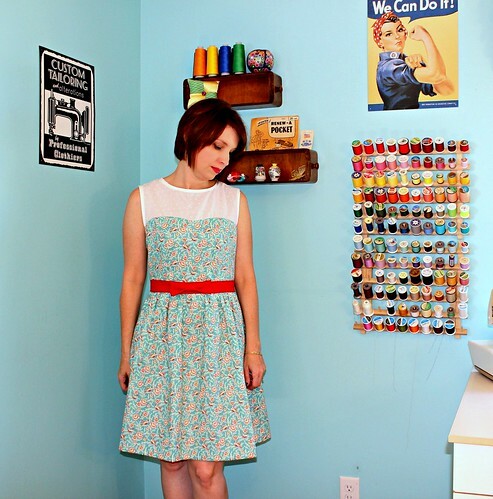 I used the skirt pattern from the Emery dress I recently tested for Christine Haynes. For my yoke fabric I chose a slightly sheer white solid embr & eyelet from Mood. I didn't care for the sweetheart look of the front yoke so I altered it to look more like the yoke on the Colette Macaron. 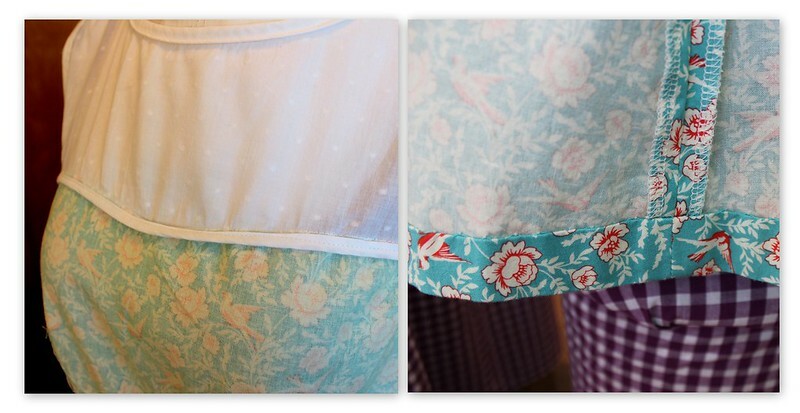 Here's a picture of the original pattern next to the altered pattern. I have never worked with Salme patterns before so here are a few things to consider. This pattern has no seam allowances. Ugh I know! 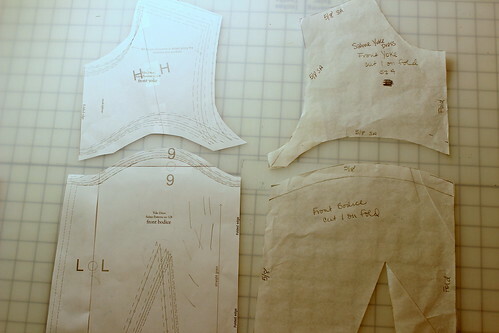 I used my tracing paper and tracing wheel to add a 5/8 seam allowance to the pattern. I also found the instructions rather vague and hard to understand. If it hadn't been for me already making the Colette Macaron and being familiar with this type of style I would of been totally lost. 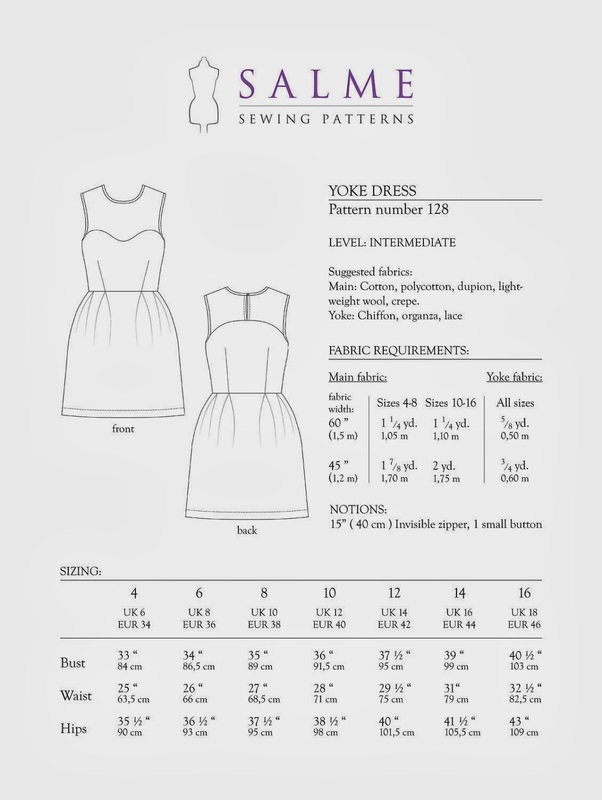 It's all the little details in a pattern that makes all the difference such as instructions how to assemble your darts and which way to press your seams and detailed illustrations. Once I got my bodice pieces attached to my yoke pieces I never gave the instructions a second look until I decided I wanted to confuse myself again. I attempted to follow the instructions on how to apply the bias tape to the armholes and neckline. I found Amanda's tutorial here more helpful. I always refer back to this tutorial when I'm applying bias tape. Lots of pictures is what I need! I made the red bow belt to add some fun to the dress. Follow Tilly's tutorial here, it's super easy and so fun to make. I'd like one in every color! It was so windy out I decided to come in and take some pictures in my sewing room. I used a french seam on the shoulder seams, bias tape for the yoke seams, armholes and neckline and serged my side seams. The hem is finished with a hand slipstich. 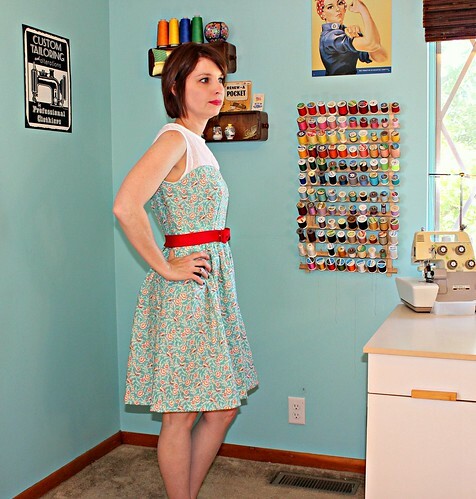 I think this dress represents my fun retro side and reminds me of something I might see on ModCloth. 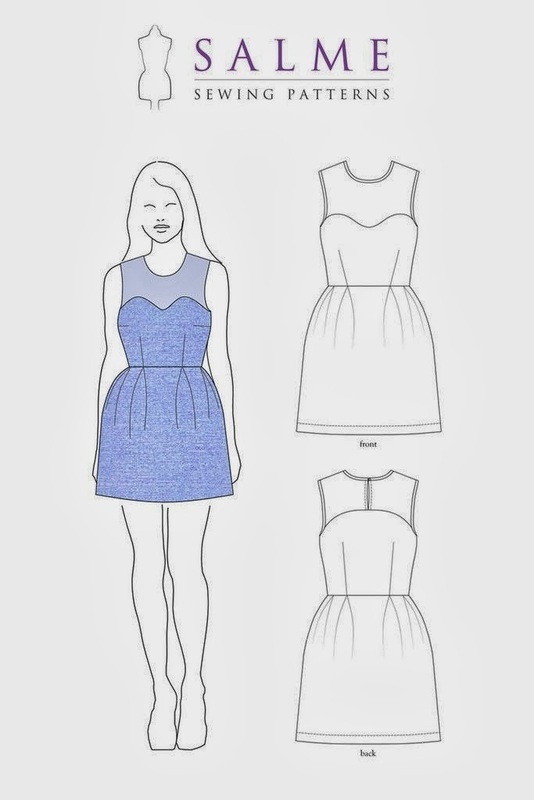 Ugh, if I ever win the lottery my whole closet is getting replaced with ModCloth dresses. 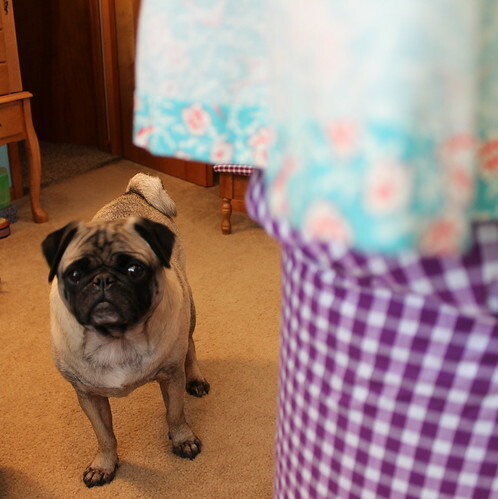 Vito says he cares nothing about dresses, he'd prefer I spend my winnings on treats and...treats. Cute Cute Cute!!! Love the fabric! What a great dress. It certainly captures what you set out to. I love all of the red accents! Very cute dress and beautifully sewn. Very cute, Shanni! A very wearable retro look and the red belt gives it such pizzazz! Lovely dress. The red bow makes the print pop! And the blue matches your sewing room! Sooo pretty!! 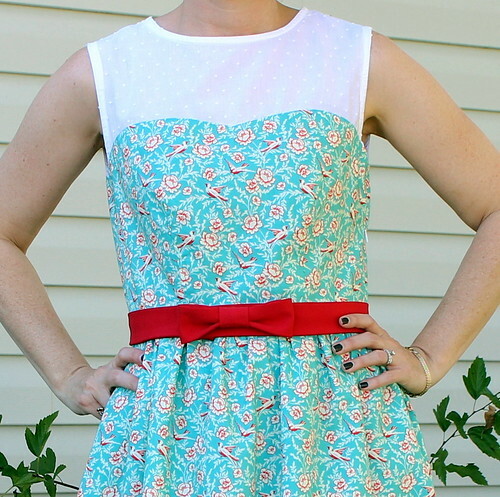 I love the fabric, the color choices, the belt, and that itty bitty little button on back!! I'd wear this in a heartbeat :) What a great fit, too. And to really get all sewing geeky... the dots on the toke fabric are oh so perfectly lined up top. And P.S. Your puggie makes me melt. Shanni, your helper just cracks me up! He looks *so* concerned!! Vito has that affect on people. lol! He was concerned alright! He was afraid that I wasn't going to take him outside. He knew my husband was outside grilling and he couldn't wait to get out there to see if he'd dropped something on the ground yet. Funny dog! Such a gorgeous fabric combination, and I love your addition of a bow belt! Thanks! When I came in to take pictures I was afraid I was going to totally blend in to the wall. lol! 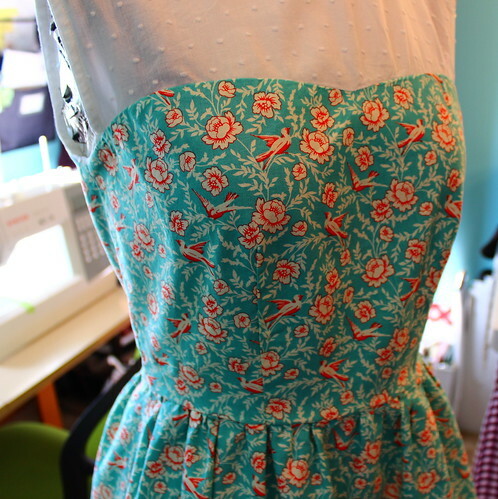 I love the combo and think it's awesome that you're already attaching the Emery skirt to other bodices! Nice job!!! Great looking dress. congrats on making it to the second round of the challenge. Your hard work paid off, you have ended up with such a beautiful dress! 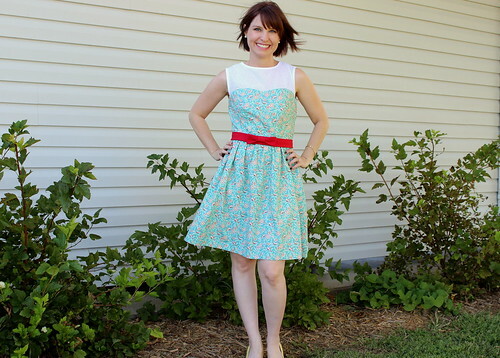 I love Modcloth too! Your dress could be one of theirs that I drool over too! Looking good. Congrats on moving on in the challenge! I love modcloth but the shipping to Australia puts it out of reach but hey that is indeed why we sew. Great for design inspiration though! I love your dress it looks amazing. I love your fabric choices. Gorgeous. Gorgeous. Your dress is adorable! I want one. It illustrates your words perfectly. That's so cute, Shanni! I love all the fabrics you put together! 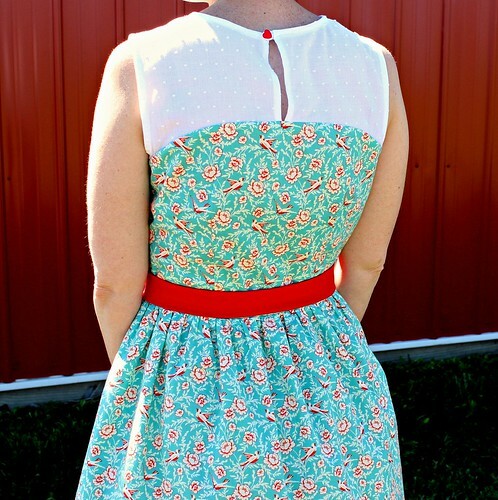 What an adorable dress, I love the floral fabric paired with the swiss dot yoke, and the belt just pulls it all together! So well thought out and so well sewn. The inside of the garment looks as nice as the outside. It fits you so well. Perfection.! Super cute. I love the fabrics you put together for it, especially the belt. This looks so wellmade, it fits you perfectly! I really like the dots on the white fabric. Adorable, I love this dress! The fabric is too pretty. And you match your sewing room. :) I love the red belt you added. Red and teal are such a vibrant combination. This is really cute and so you! I love it on you! My sister bought a Salme pattern-- she's just beginning to sew-- and was having some trouble with it. I took a look at the instructions, and I was having the hardest time trying to follow them. It's awesome that you're a proficient enough sewer that you can make something without instructions and you can alter a pattern to suit your own style. Great job, girl! Super cute! The red bow belt and button in the back are the perfect finishing touches. Absolutely adorable! 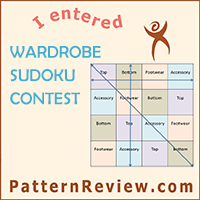 I appreciated your review of the Salme pattern, as I am a beginner and require lots of detail in pattern instructions. The only thing I would change about your dress, and it is strictly a matter of personal preference, is that I would use a white button, rather than red, on the back.